For all your lingerie dancing needs. Earlier this evening, Rihanna closed out NYFW by unveiling her brand-new Savage X Fenty lingerie collection. 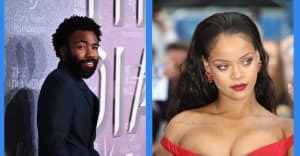 The event, which was streamed live from Brooklyn, New York via RiRi's YouTube channel, featured a ton of memorable moments, including appearances from models including Slick Woods and Bella Hadid, a killer dance number that appeared to be choreographed by Parris Goebel, and an electro-heavy playlist. Take a look at the songs below, and shop the new collection online.